First country that was benefited of that help was Greece, which was struggling against Communist influence coming from the Soviet Union. The US helped the precarious Greek financial system in an attempt to excerpt more influence than the Soviets but got lots of critics in their own territory: “The losers where population as a whole, who were denied the competitive process produced by cheap imports, suffered from the resulting inflation, and were the universal victims of the ultimate “dégringolade””. (Johnson) It was clear than US external financial aid need a “stronger” reason to act than just helping precarious economies. In June 1947, Secretary of State George Marshall proposed that the United States provide aid to all European nations that needed it, saying that this move was directed “not against any country or doctrine but against hunger, poverty, desperation, and chaos.” (Johnson) Even tough the nations receiving aid had to remove trade barriers which, at the end, resulted in lots of cheap exports for US products into Europe, that idea proposed by Marshall was received with lots of critics from many people that did not want to give US money away as what they thought were just humanitarian reasons. 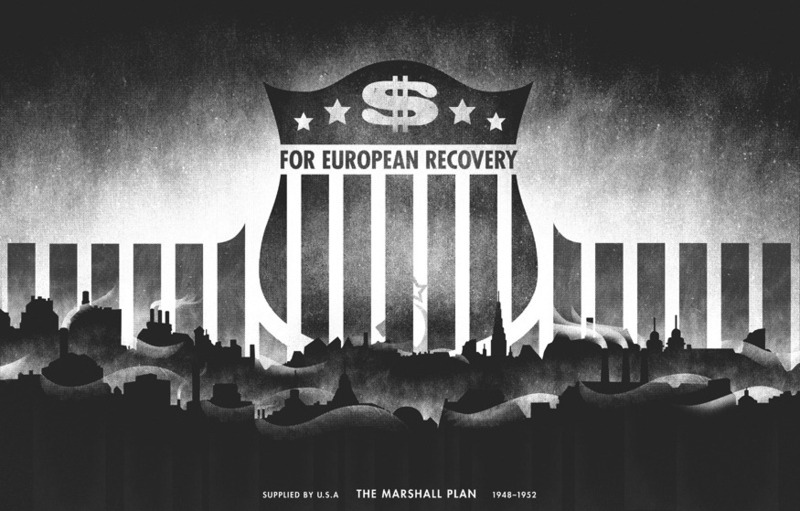 Congress debated the Marshall Plan for several months. Then, in February 1948, Soviet tanks invaded Czechoslovakia and took over the country. This invasion and the blockade than the Russian government implemented on Berlin was the impulse that the US Congress needed to finally approve the Marshall Plan. They finally became aware that Europe probably could not resist communism influence without strong, stable governments. US money should help in order to gain influence in those regions. More than sixty years ago, the reminiscent of Marshall Plan are clearly shown in Western Europe. America expanded his economy overseas after that and nowadays it seems impossible to find any country where there is not a single US company operating there. On the contrary, communism is a political theory doomed to ruin and just have some influence in autocratic governments like Cuba or Venezuela. Publicado el 21 junio, 2014 en Historia y etiquetado en el Plan Marshall, historia, Soviet Union, USA. Guarda el enlace permanente. Deja un comentario.